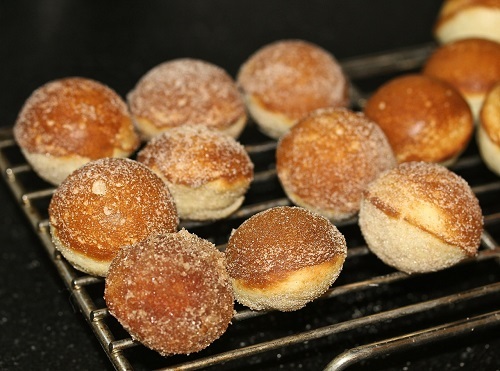 Mix flour, sugar, baking powder, salt and nutmeg. Add other ingredients and stir until combined. Fill each cup about ¾ full. Bake 6-7 minutes or until tops spring back when touched. Cool in pan, then remove to rack and allow them to cool another five minutes. Mix cinnamon and sugar together. 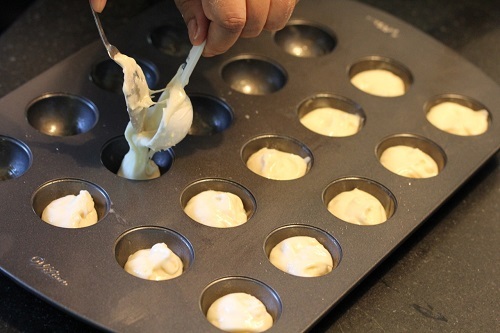 Roll donut holes in mixture and serve. Beat cream cheese and sugar at medium speed. Add peanut butter, salt and vanilla. Whisk cream until peaks form, or fold in ready-made whipped cream. Using fine piping tip, pipe grape jelly into the center of the donut hole. 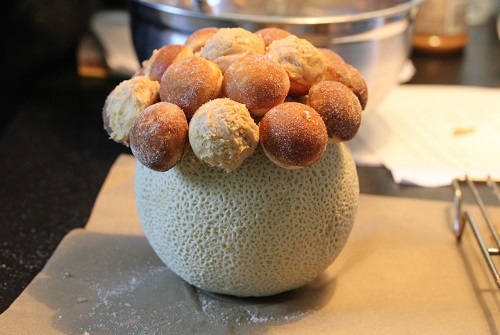 Cover top half of donut hole with frosting and affix to cantaloupe, or just put it on a plate. Roll the frosted peanut butter donut holes in mini semisweet morsels for a chocolate-peanut butter donut hole.